Old man winter took at big hit at Lake Wicwas today. A southwest wind brought in warm air, and with strong sunshine in the afternoon, the temperature rose to 55 degrees! How often can you actually sit outside and enjoy the sun in February? There was lots of melting on the lake, on roofs, and on the ground, although there's still two feet of snow pack even in open areas - more in the woods. The monuments at Oakland Cemetery are starting to poke back up above the snow line. 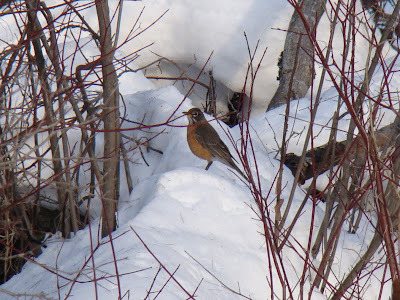 And believe it or not, just one warm day brought the first harbinger of spring - we saw our first robin by the stream at the outlet of the lake. And the mystery of the slush on the lake continues: today, after a couple of days of temperatures above freezing, and even some rain, the lake is frozen again! There's still slush in some of the protected coves, but in the open parts of lake there's a couple of inches of snow, and then firm ice underneath. Maybe tomorrow I'll drill a hole trough the ice and see what I find. We all know this warm weather is just a tease, as there's plenty more winter weather ahead, but it's enough to remind us that winter will end.